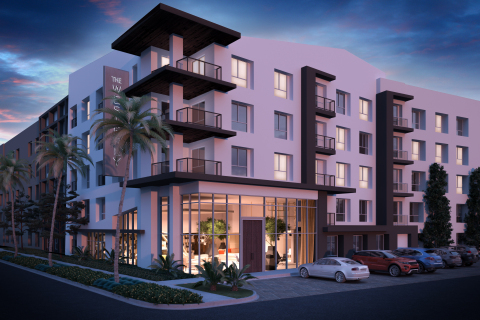 IRVINE, Calif.--(BUSINESS WIRE)--Sanderson J. Ray Development today announced ground breaking on The Westerly, a new Class-A luxury apartment development located on the southwest corner of Main St. and Jamboree Rd. in Irvine, California. The development marks Sanderson J. Ray’s first large-scale luxury apartment complex. The Westerly is located on a 5-acre high profile parcel in the Irvine Business Complex. The completed project will include 388 modern luxury apartment units with a rooftop deck lounge and access to private community pools. Some of the features include a rooftop sunning pool, outdoor lounges, and a private resident’s lounge with full bar. The gated building features a tree-lined entry featuring upscale landscaping and countless styled retreats. SJRD is an Irvine based commercial developer with a 35-year track record and impeccable reputation. SJRD has equity in excess of $200 million in stabilized mature assets with strong cash flow. Sanderson J. Ray Development announced ground breaking on The Westerly, a new Class-A luxury apartment development located in Irvine, CA.